Premier League: Won in similar fashion to my first season, down to the wire against ManU, my team romped the first half of the season and didn't lose a game until playing Man City where Aguero scored 4... build up of fixtures and niggling injuries started to add up toward the end of the season lead to a form slump (draws and a costly loss to ManU) but still won the league by 2 points. Goal difference of 78 too. 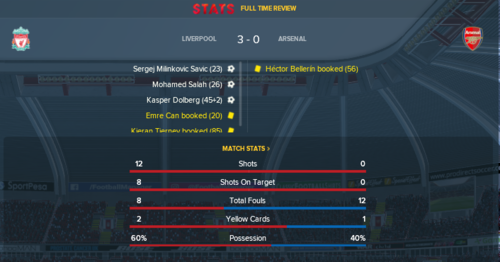 Champions League: Knocked out in the Qtrs by Arsenal, lost 3-1 away with a really late goal to them and could only muster a 1-0 win at home in the second leg even with 10+ more shots. Part of a my aforementioned form slump. Cups: Won the community shield and Caraboa cup but knocked out of FA cup by Chelsea, once again during my form slump. Salah was the player of the season, mainly as a winger on the right but also occasionally filling in on the left he racked up 13 goals, 22 assists and had an average rating of 7.62 in 37 apps. Won English POTY and POTY but didn't make the end of season PL team? Coutinho was immense the first half of the season in all comps, at the halfway mark lead the team for goals, assists and avg rating but then picked up a few different short term injuries. Played a couple of blinders on the left but is the focal point of my team at AMC. Kean got as many cup games as I could give him and played well in those chances, him and Woodburn scored plenty of cup goals, made my TOTY team as striker over Firminho and Studge. Players who keep performing better than expected: Sturridge (20 goals all comps), Ox - Happily shifting Salah to the left so he can play right and better than Mane, Lallana - Good tutor and fill in AMC when I want to rest Cou, Wiljnaldum - just gets the job done when I rotate him in and all my fullbacks have been so solid that I don't feel the need to bring new ones in. De ligt needs a mention because though he's performed great he's hated me the whole season after I failed to 'give him opportunities in cup games' in his first season as promised even though he played all cups in his first season. Thought it would have sorted itself out by now but still can't talk to him and he wants to leave and with only a year left on his contract I'm worried. I want to make a good run in the champs league, I like my team a lot and don't really feel the need to buy anyone but I think I may have to splash out on a superstar or two to go next level (Dyabla). Wiljnaldum and Mane were both good this year but if I bring in more players they may have to go other wise I'll have too many players who will complain. 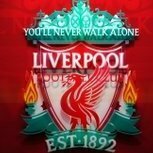 Milner's contract is expiring and Lovern will probably be sold, don't think wilson will make it here either unfortunately. Matip and Firminho are getting new deals too and whilst Bobby is being reasonable for a 30k raise Joel wants to double his wage and I'll probably end up having to pay him ~175k, think I'll also reward a few other players with new contracts too depending on signings and my wage bill. My tactic works great most of the time, buckets of goals and routinely beat teams 4/5-0 but also prone to conceding late in games and to crosses and wasting opportunities with ridiculous long shots. Tweaks I'm thinking is dropping CM-DLP to DM-DLP for an asymmetrical pairing and making my fullbacks more defensive even though I love their overlap. Thinking I'll play my wingers on the same side as their stronger foot, they'll still cut inside due to their PPM's but they cross so often that I'm sick of wasted chances due to rubbish crosses on their weaker foot. I've noticed more tap ins from good crossed when Salah is on the left and Ox is on the right rather than Salah right and Mane left. 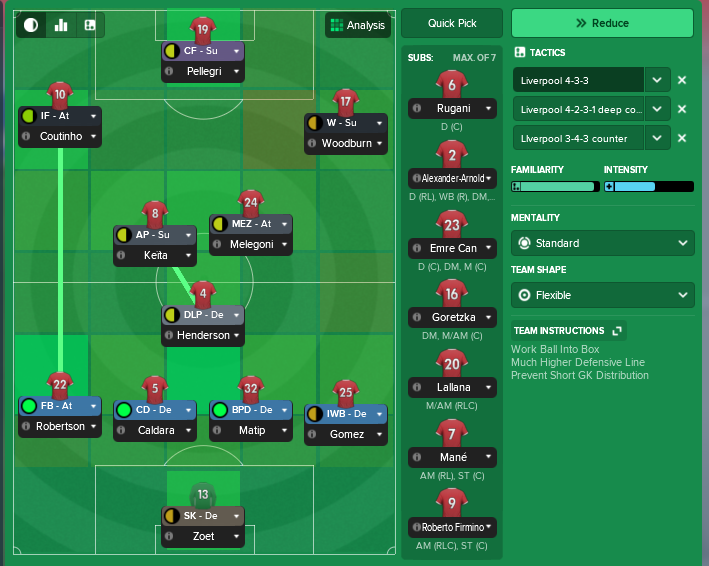 I leave it opened and generally only pick up 1 or 2 youngsters that I want for the future, I like to keep the core of the team too in future seasons and am not a huge fan of blowing up the roster to make a superstar team, I'll probably never sell the likes of Gomez, TAA, Matip, Hendo, Salah, Cou and Firminho but some may slowly be phased away from being key players the longers I play. Defence is surprisingly solid, as is most of the team, but lacking a top class CB and GK. Right back is sorted with Clyne, TAA and Gomez but neither Moreno or Robertson are world class, both been very good for me though. Anybody promoted Curtis Jones to the first team squad? During my 2nd season he played a couple of cup games and did very well. He also had superb figures whilst playing for U23's. Now during pre-season of 3rd season and hoping that he can secure a first team squad slot. 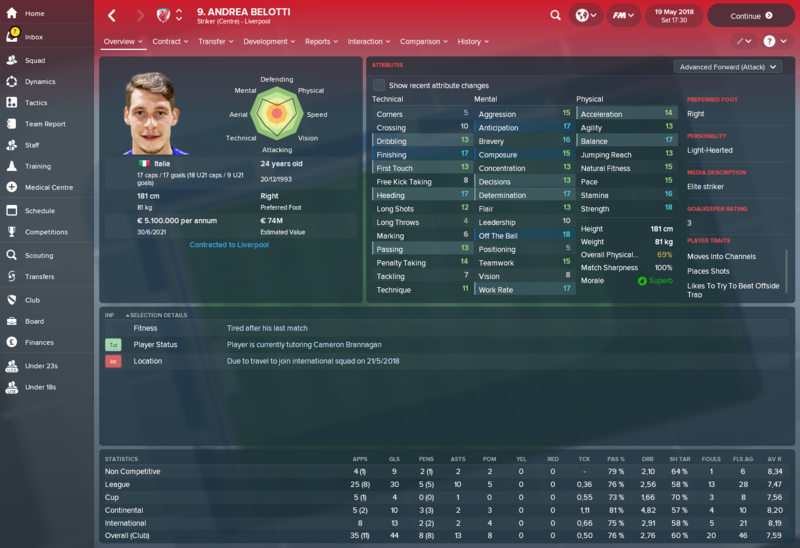 As I mentioned previously in this thread, I signed Andrea Bellotti from Torino before my 2nd season. He now almost makes this Liverpool save too easy. Through 21 total games he has 28 goals. 28 goals!!! Just to put it in perspective, Firmino had the most goals for me in my 1st season with 25. I'm not even in January yet and Bellotti has 28! 15 of his 28 goals were in league play and he leads the league with those 15 goals. He's unstoppable. Glad to see I'm not the only one who Belotti performed for! He's an absolute monster! 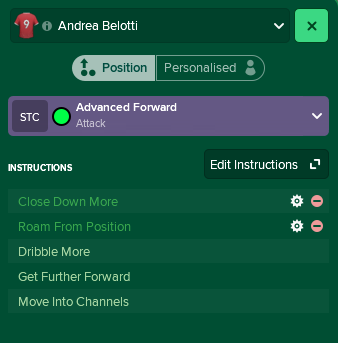 Man U was interested in Belotti on my save as well. I swooped in and bought him before they could and Man U decided to buy Icardi instead for about twice as much as Belotti. Icardi ended up breaking his leg and he's still out injured going in to January. I find it highly satisfying! wow just seen the news, VVD!! do we think he is worth 75m even in todays market?? I have my doubts but would be really happy to be proved wrong. Almost bought VVD in mt game, but after seriously looking at his stats i decided not to. His mental stats arent that great tbh, and i had a look at his hidden attributes and his professionalism is really really low due to the transfer blunders irl. Ended up with Rugani and De Ligt instead. Same here. After hearing we got him in real life I took a serious look at him on FM. There are CB that are much better for a way lower price. Im thinking of selling Salah. I like to play with a winger on one flank and IF on the other, but currently all my best wingers/crossers are right sided, and i have a lot of good Inside Forwards on the left, Mane, Pulisic, Woodburn, Coutinho (mainly play him central tho). So Salah currently doesnt fit into my tactic, with his preferred foot being his left and cuts inside PPM i dont think hes offering enough width. Regarding Rugani, he is now my best CD. Just above Matip now, even scored a hat trick from corners and a header from a free kick. With de Ligt and Gomez available too. De Ligt, still only 19 years old and in his second season with us, made the World Best XI as a starter! I know I keep praising this kid in this thread over and over, but he has been unreal. Coutinho also made the starting team and Belotti made it as a backup. Three Liverpool players in the world's best team! 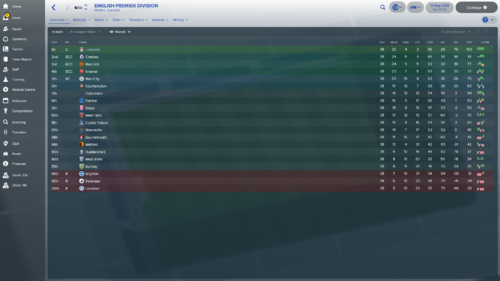 Alright, so I just entered the January transfer window in my 2nd season. Real Madrid have offered $101 million total for Salah. And that's before any negotiations have taken place. He's been an extremely good player for us for the past 18 months since I started. He's labeled as a world class player and he lives up to it more often than not. But an offer that big is hard to turn down. I play Salah as an IF on the right side. I have Ox, Domenico Berardi, and Woodburn (on loan) who can all fill in. Ox and Berardi, especially. Do I try to squeeze Madrid for every last dollar and sell Salah or do I keep him and inevitably I am forced to give him a new, huge contract when his agent comes calling because I declined the offer? I previously sold Mane in my first year to Barca for $110 million and haven't regretted it one bit. We won the PL title my first year and this year, unless something horrible happens, we will win it again, by a big margin. Wondering testing it. What kind of match prep do you use? Delighted with my league performance in the first season, full review to follow. In my Liverpool save I sold Salah, Coutinho and Firmino due to either they couldn't get in my team and were moaning or a big offer came in. Im thinking of changing my formation. 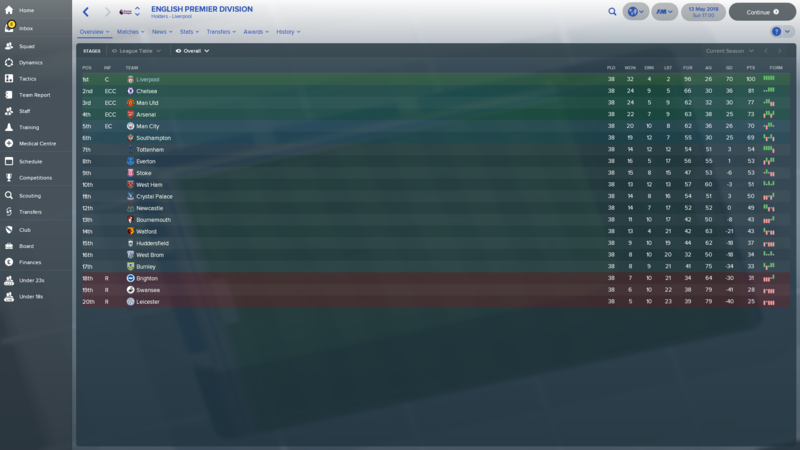 Currently 4-1-2-2-1 and won the league with it but was never happy with it. Tried to get the best out of 2 Inside forwards (Mane and Salah), but while i was winning it just never seemed to click like my FM17 formation did when i used a winger and IF. So am thinking of going back to my FM17 formation, 4-2-3-1 but with 2 DM and using a Segundo Volante inspired by Cleon. The SV role would either be Hendo, Can, Keita or maybe even retraining Dele Alli (bid accepted) to play there as Coutinho will be playing AMC role. You can use a Winger and IF again with Mane and Salah. I don't see the problem. I leave the match prep to my assistant. So I sold Salah to Madrid for a total of $110 million. The same amount I previously sold Mane to Barca for. I was expecting the team to be upset but they weren't bothered by it at all. Now I have about $130 million in transfer room. Madrid transfer listed Isco for $79 million so I went and offered that. Man U, Arsenal, and Bayern also want him. If I get him he'll fit in perfectly in the AMC spot that Firmino plays in. Firmino has not played a good second season thus far. His average rating of 7.10 is the lowest of the entire team. Isco is willing to play for us as a rotational player so I can swap him and Firmino in/out. I really, really, really want to buy a new GK. Mignolet and Rajkovich are playing fine. I rotate them unless one of them gets on a hot streak. But both of them are now rated only 2 1/2 stars, Mings won't get any better, Rajkovich will get better but I still don't know if he's starting level PL quality. De Gea is unsettled at Man U but there's virtually no chance they'll sell him to me. Oblak is way too expensive after he signed a new deal. Geronimo Rulli from Real Sociedad has a release clause of $41 million and is 3 1/2 star rated. He looks promising. I'll keep looking. Can anyone give me an idiots guide breakdown of what the wages section of the Financial Fair Play regulations are? I'm approaching season 2 and have been advised I'm going to breach them! I don't know the exact percentage, but you can only increase your wages so much each year. I've never been fined for this, but I don't think the punishment is too severe. I think the EPL just fines you a percentage of the wage increase but I could be wrong. was very happy with this result. I've had a lot of 0 shots on target, but it's extremely rare that a quality opposition doesn't even attempt a shot. Thank you, managed to find a topic on it that explains it reasonably well. I hate that formation. Stoke beat me with it also. How did you line up? Well Emre Can has just shafted me in my first season on the eve of the Champs League semi 2nd leg. He wants a new contract, bearing in mind he signed one in pre season. Whole squad unhappy after I told him no. Matip wants 200k. Klavan 150k. Anybody else experienced silly demands? I changed roles around throughout the match, but it was something like this (not the same players but the tactic). I'd actually had decent success against the 3-4-3, but I always struggled with their early overloads on the flanks. If I pressed they would high and "prevented short gk distribution", their 3 cbs would bypass the press and would have a 2-1 against my fbs. If I sat deep and countered they would also overwhelm my fbs and eventually draw them out of position. So this game I made a relatively minor TI and asked them to show their outside cbs to the middle of the pitch and had us man mark Ozil who was playing as a dlp. We also closed down and/or tackled hard on most of their attack players and they could barely get the ball out of their half. This could have been a one-off, but I hate playing against the 3-4-3 so hopefully I can build on this. It's very frustrating and Gini doesn't do it when he plays the role. Should I try to unlearn PPM's (have people tried and had luck with this?) or are there PPM's that he could learn to lessen the shots? I sometimes feel he plays like the arse-end of the Rodgers-era but he has options to play people in but chooses to shoot. In squad harmony he is also one of a handful of players that dislikes me. Not sure if this effects wether he listens to my instructions or not. Really great squad to start with, but I wanted to make it stronger. My biggest focus: more quality at the back. Had some money left so I also bought (for the next season) GK Kepa from Atletico Bilbao (5,5m) and MC Arthur from Gremio (13m). And of course Naby Keita coming in next summer... Ragnar Klavan is also on his way out (10m) with several clubs interested. My idea is to fit my four best players Coutinho, Mané, Salah and Firmino in the first eleven. I see the players like gearwheels , and my job is to make them work together like a engine. My plan is to give De Ligt as many games as possible as well. Play de Ligt in every game possible. He made the World Best XI for me in his second year at the age of 19. He's unreal. Thank you for the advice! I´ll keep that in mid. I always tell players that they have plenty of time left on their current deal. Never have problems with that response. Another crashed save for me. Not too sure why, but hey ho. Always have a backup save. I have three saves but only use one of them actively. I just update the other two after a week or so goes by in my game. I had a save get corrupted last FM and lost about 200 hours worth of playing. Skins crash my games. I just load in kits and logos nowadays and it runs without complications. I haven't sold Coutinho but I've sold Mane and Salah. Mane got me $110 million and Salah got me $111 million. Coutinho's value is higher then both of those guys so I wouldn't sell him for anything less then $120 million-ish.